Key senators from both parties at a hearing Wednesday encouraged the Trump administration to pursue “low-hanging fruit” as it tackles its reorganization of the executive branch, while leaving more ideological debates for separate fights. Lawmakers also encouraged the administration to listen to front-line federal employees as they shape their final suggestions to reform themselves. A union leader, however, said agencies and the White House have declined overtures to work with them and hear the ideas the group has gathered from its members. Agencies turned in preliminary reform plans to the Office of Management and Budget in June, and will submit their final proposals later this month. OMB declined to send a witness to the hearing, which caused Sen. Heidi Heitkamp, D-N.D., the ranking member of the Senate subcommittee holding Wednesday’s hearing, to say she was “deeply disappointed.” Sen. James Lankford, R-Okla., said OMB did not object to testifying at a later date, but explained it was too early to offer its thoughts to Congress. But he and Heitkamp said they fully expect OMB to appear before their subcommittee at their next hearing on the subject. Tony Reardon, president of the National Treasury Employees Union, told the senators he solicited feedback from his chapters throughout government and offered to sit down with Linda Springer, then a senior adviser at OMB and one of the leaders of the reorganization effort. NTEU’s suggestions included reducing management layers, increasing telework and boosting support staff so mission-critical employees can avoid getting bogged down in administrative work, but the union has yet to have an opportunity to relay those proposals. Lankford said he makes a habit of speaking with rank-and-file workers whenever he visits a federal office and they typically make a point to suggest ways to improve their operations, including by eliminating unnecessary tasks. The senator sought to assuage concerns that the Trump administration is not hearing those front-line suggestions, noting a variety of agencies and OMB have assured him they are receiving thousands of submissions from employees. Reardon emphasized that agencies need to work with employees not just through online submissions but with their representatives, such as his union. He noted it is “altogether different" to actually engage and sit down with employees than to just hear from them through an email or completed form. The perspective his organization is afforded by working with so many agencies, he explained, gives it an advantage in seeing what is working across government and how to apply those lessons to individual agencies. 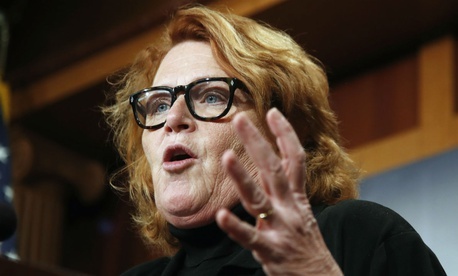 Heitkamp first suggested the administration tackle low-hanging fruit, citing a litany of duplicative programs that could be consolidated and other reforms to which both parties would readily agree. She referenced NTEU’s proposal to remove layers of management as something that both Republicans and Democrats have suggested and that could be an easy win in the administration's reform efforts. Lankford agreed the Trump administration should take the easy wins where it can. “We should always focus on low-hanging fruit,” Lankford said. “If we have common ground, that should be common sense to focus in on those areas of duplication.” He noted there could still be difficulties, as various committees of jurisdiction could quibble over which agencies get folded into others. Ultimately, he said, Congress and the administration needed those areas of agreement to build relationships and gain momentum toward larger goals. As it works toward those broader objectives, Lankford encouraged OMB to continue to exert its influence. Taking suggestions from front-line workers alone likely will not result in cross-cutting agency reforms, he explained. Rachel Greszler, a research fellow with the Heritage Foundation, suggested Congress form a bipartisan special commission that can make reorganization proposals that then receive quick up-or-down approval votes. She downplayed the notion that the commission should focus only on uncontroversial measures, citing as an example that federal personnel changes were critical to any reform efforts. Robert Shea, a public sector principal at Grant Thornton and former OMB official focusing on government reform in the George W. Bush administration, agreed with the need for such a commission but threw cold water on any ideas it would quickly fix all that ails government. He added no one should expect major deficit reductions as a result of the administration’s efforts. “We will not be balancing the budget on reorganizations,” he said.